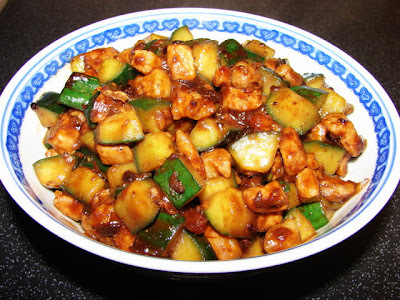 Most people have cucumber raw or pickled, I love stir fried cucumber. This is a simple stir fry but the recipe is not that common. The original recipe is from Ching Imperial kitchen specially made for Empress Dowager Cixi as condiment or side dish. Traditional raw vegetable pickle was normally served but because Doweger had a tender tummy, her chef made this cooked condiment/side chao hwang gua jiang, specially to whet her appetite so she could enjoy the rest of her meal. This stir fry recipe and ingredients are really simple; main ingredients are pork, cucumber and yellow bean sauce. 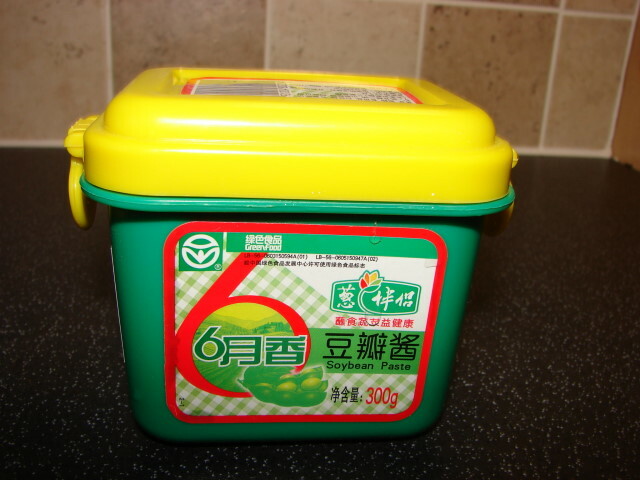 I bought this tub of yellow bean sauce sometime ago been meaning to road test this. The English name for this sauce is soy bean paste but in Chinese it is douban jiang 豆瓣醬 (confusing?). 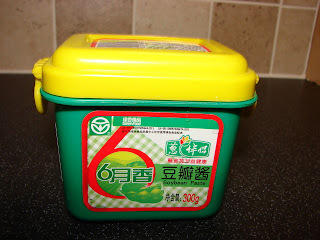 This douban jiang is not the same Sichuan chilli bean paste. There is no chilli it is just fermented soy beans i.e. yellow bean sauce. The sauce is much darker than most yellow bean sauces I have come across. Nice fermented soy fragrance and quite tasty with an undertone of fermented black beans, dousi. I used this fermented bean paste for this stir fry recipe. The pork and cucumber coated with the sauce was tasty, full of flavour and cucumber was crunchy. I have it with plain rice and nothing else. Simple meal. Cut the cucumber lengthwise into quarters. Trim off the soft core. Cut the cucumber into 1 - 1.5cm pieces. Mix with salt and leave it for about 15 - 20 minutes to draw out some of the juice. Rinse the cucumber to remove salt. Drain. Cut pork fat into small pieces. Cut the lean meat into 1cm cubes. Mix lean meat with light soy sauce and cornflour. Leave for about 15 minutes. Chop spring onion and ginger. Stir fry the pork fat with a little cooking oil till most of the fat is rendered and pork fat is brown in colour. Add lean pork, stir fry till lightly browned. Add spring onion and ginger. Continue stirring for a little while. Turn heat down to medium. Add yellow bean sauce stir then add dash of cooking wine. Keep stirring till fragrant. Make sure the heat is not too strong or the bean sauce will stick to the wok and becoming burnt. Stir in the cucumber, stir till warm through and finally add some sugar to taste. I'm a relative newcomer to stir-frying cucumber, but whenever I do it I love it. I will keep a lookout for the paste. If this a firmer variety try pickles. 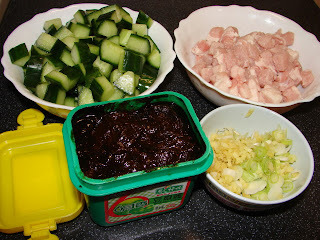 Check my recipe for soy/vinegar pickle and cucumber kimchee very good too.